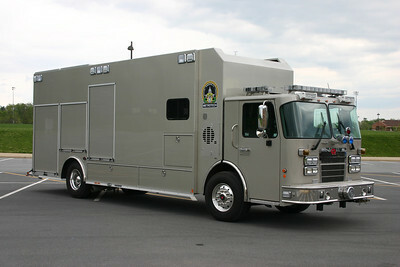 The Fire Marshal's Office took delivery of this Bomb Disposal Unit in 2011. It is a 2010 Spartan Metro Star ER built by Rosenbauer. 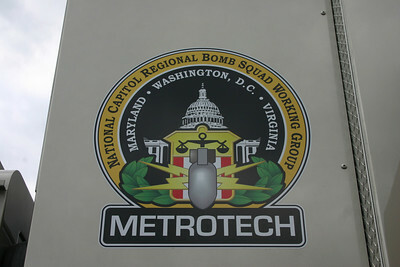 It is one of six identical units delivered to various departments across the Washington D.C. metropolitan area (Arlington County, Prince George's County, Montgomery County, Washington Metropolitan Area Transit Authority, and the Virginia State Police). Each department painted their trucks in their respective colors. Loudoun's will remain basically unmarked and painted in the color you see. 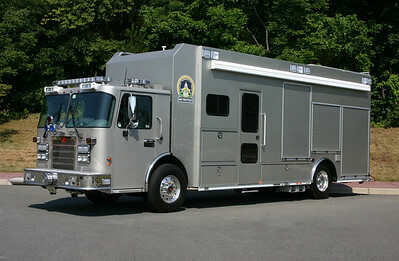 The new bomb unit made an appearance at the 2011 Apple Blossom Festival in Winchester prior to it being placed into service. 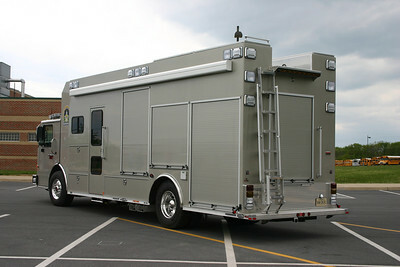 Some of the features include a 27' body, interior command area, ramps that allow remote controlled robots and equipment carts to enter/exit, awnings, explosive containment lockers in the body, roof top compartments, 20 kw generator, light tower, and a 25' telescoping mast for a camera. 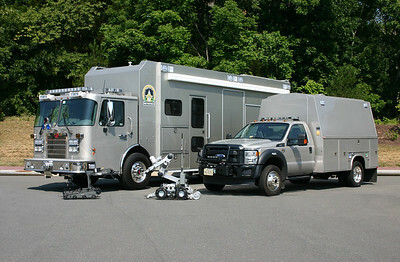 Rear view of the Loudoun County bomb disposal unit. A second bomb disposal truck is BD 660, a 2011 Ford F550 with a Knapheide body. Like the larger Spartan/Rosenbauer's, six of these trucks were delivered to departments throughout the Washington Metropolitan D.C. area. Bomb Disposal 660 will remain with no markings on the truck. 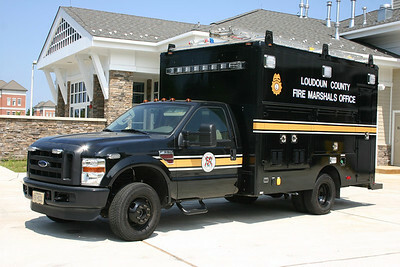 Loudoun County's Fire Marashal's division Bomb Disposal 600 and 660. A group photograph of Bomb Disposal 600 and Bomb Disposal 660, with two of the Fire Marshal's remote control robots. This photograph was taken in July of 2012 near the apparatus warehouse in Ashburn. The Fire Marshals Office also utilizes this truck to assist in fire investigations. 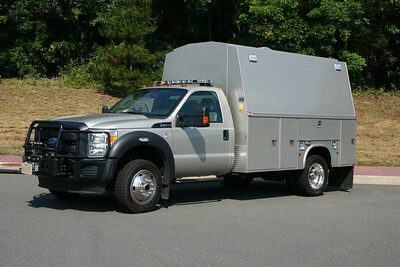 LAB 600 is a 2008 Ford F350 with a 2009 Supreme body. This photograph was taken at Station 22 in Lansdowne, where the truck had been kept. It now resides at the Fire Marshal's office in Ashburn (old Fire Station 23). 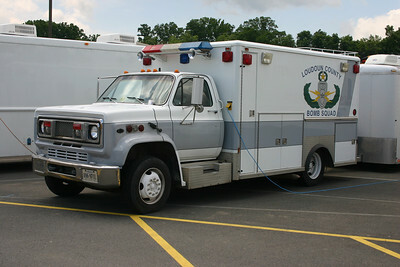 The Fire Marshal's first bomb disposal truck was this 1989 Chevrolet/Wheeled Coach, which was an old ambulance from Sterling Rescue. 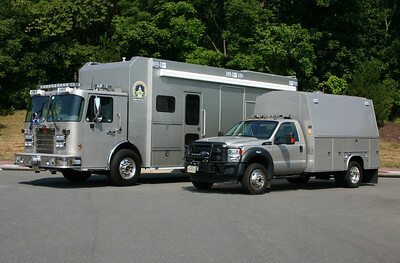 Sterling Rescue had two similar ambulances, and they were the first monster medics delivered in Loudoun County. While in service in Sterling, they were painted white with green stripes. This photograph was taken at the county yard in Leesburg just prior to the truck going out of service. 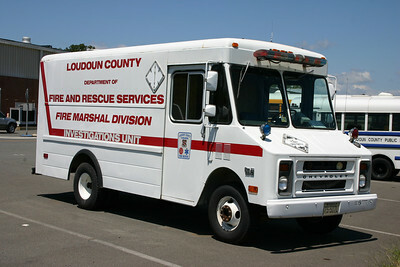 Former Loudoun County Fire Marshal bomb unit. 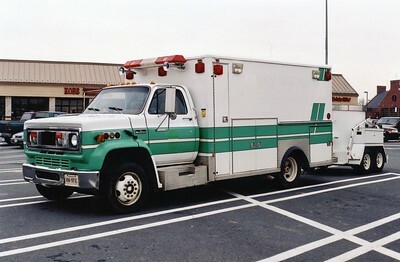 A 1989 Chevy/Wheeled Coach, this is an ex - Sterling Rescue Squad ambulance. The old FM Investigation unit, a 1990 Chevrolet Step Van that was previously a county work truck. 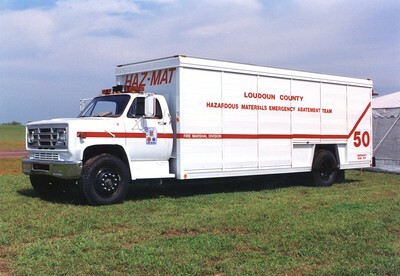 Former Unit 50 was a Hazmat truck operated by the Fire Marshal's in Loudoun County. This 1978 GMC/Belton was sold in 2005.